Let’s begin with a review of the results of the 2016 general election. About 139 million Americans, or 60.2 percent of the voting-eligible population voted, according to the U.S. Elections Project. That compares with 58.6 percent of eligible voters who turned out in 2012, but it’s below the 62.2 percent who turned out to help elect Obama for the first time in 2008. Approximately 63 million voted for Donald Trump; 66 million voted for Hillary Clinton, winning her the popular vote, although she lost in the Electoral College and Trump became President. She lost several key rust-belt, battle-ground states including Ohio, Pennsylvania, and Michigan. 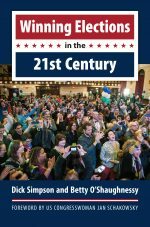 In Winning Elections in the 21st Century, we wrote that to have a chance at winning, campaigns needed to develop a strong campaign theme and message; raise sufficient funds; identify their voters, and get them to the polls. How successful were the major candidates in carrying out these activities in the November 2016 election? Results were mixed. As for messaging, Donald Trump’s “Make America Great Again” and Bernie Sanders’ “Political Revolution is Coming” slogans were more appealing to certain voters than Clinton’s vaguer “Hillary for America.” When it came to funding, Hillary outspent Trump by almost twice as much, $1,191M to $646.8M; but like Obama, Trump collected more money from small donations (less than $200) than did his opponent. As to finding supporters, Trump managed to reach his voters better than Clinton reached hers (as did Bernie Sanders). The most important aspect of the election was turnout. As described below, turnout from expected Clinton support groups were lower than Trump’s. Breaking it down by voting groups, Trump won the white vote (57% t0 37% for Clinton), but won college-educated whites voters only by 48% to 45%. Many people felt disenfranchised by the Clinton campaign; and the anger of white Bernie Sanders voters showed up in states such as Michigan and Wisconsin, states whose Democrats had supported Sanders in the primaries but voted for Trump in the general elections. The majority of all minority groups voted for Clinton. While African-American turnout was lower than 2012, still 88% voted for Clinton. Hispanic voting was up, but lower than other groups. It was not as heavily pro-Hillary as expected; while 65% voted for Clinton, while 71% had voted for Obama in 2012. More Hispanics voted for Trump than had for Mitt Romney four years earlier. While 54% of all women voters chose Clinton, and women in all minority categories voted for Clinton, this did not hold true for white women, 54% of whom voted for Trump. The large turnout of women voters for Clinton upon which her campaign was counting did not happen. Clinton’s 12-point margin over Trump among women was only one percentage point higher than Obama claimed in 2012. Lately activists are emerging particularly from two groups: women and millennials. Beginning with women: while men vote for women candidates as often as they vote for men, and while women have long been activists, as a group they have been reluctant to run for office — currently making up only 20 percent of elected officials in the U.S. Women tend to enter electoral politics at lower levels such as school boards, and once in office, are less likely to climb the political ladder for higher office. The gender gap increases with the level of elected office. Men are 16% more likely to be recruited by political actors, or even encouraged to run by family and friends. Finally, women often see the qualities desired for candidates, such as ambitious or risk-taking, as not very feminine, and few see their spouses taking over household responsibilities if they were to run. Happily, as of the middle of February, 390 women are planning to run for the House of Representatives, as compared to 272 women who filed to run before state deadlines in 2016. Getting more women to run is important on several levels. Men and women have different backgrounds and outlooks, meaning that equal representation will expand the character and content of legislative debate. Moreover, women’s presence in legislatures changes what issues get on the political agenda. Since studies have shown that most Republican women will vote with Democratic women on issues such as health care and education, having a critical mass of women in legislatures could change the legislative agenda to one that is more family-oriented and nurturing. Finally, with women voting together across the aisles, more women in office could encourage a thaw in the current political impasse between parties. Millennial voters reflected the demographics of the general youth population. According to Tuft University’s Center for Information & Research on Civic Education and Learning (CIRCLE), millennials had a voter turnout of almost 50% in November 2016, although in eleven battleground states their turnout was closer to 55%. As a group, more millennials consider themselves independents than the rest of the voting population, although they tend to vote more as progressives than as conservatives, with the exception of non-college educated white males: Clinton carried all millennials 55% to 37% percent, but 52% of white millennial males voted for Trump. It is important to make sure that this generation is included in the political process, but that does not always happen with the major party organizations. Many millennials felt ignored or bypassed by regular party activists during the November 2016 campaign. Today we have a polarized country and voters are more reluctant to become involved in what they think is the dirty business of politics. To change the direction of the country, the 2018 elections will have to get more people to participate than they did in the 2014 nonpresidential election when the vast majority of us stayed home.